Good morning. Welcome to Thursday Thoughts. In keeping with the holiday spirit, we are talking with Johnny Gunn today about his book Slick’s Special Christmas. Blizzards, wild cows with long horns, and singing buckaroos. 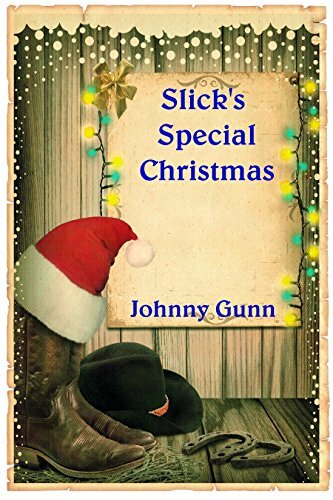 It’s Slick’s Special Christmas. I've had a wonderful and varied time along this bumpy highway called life. I spent my early years in Santa Cruz, California, swimming, fishing, and wallowing in the splendor of redwoods, the Monterey Bay, and a loving family. Then, my four years of high school were spent living on the Island of Guam. That was back in the early 1950s Yes, Virginia, I am that old, but only in body, not spirit. My first job in radio was in 1958. I bought the Virginia City Legend newspaper in that old western mining community in 1971, and retired from having a job in 2010. That's when I changed from being a reporter of news to being a writer of fiction, and over these last few years have found my western and crime/mystery stories published as novels and in magazines and anthologies, around the world. My beautiful wife Patty and I live on a small hobby farm about twenty miles north of Reno, Nevada, sharing space with a couple of fine horses, a flock of egg-producing chickens, and some breeding rabbits. You're always welcome to visit. I need help cleaning those corrals.